A seminal map in the search for a Northeast Passage to Asia. Tabula terrae Nouae Zemblae in qua fretum sinusq Waigats item ord littorialis Tartariae atq Russiae, ad urgem usq Kildeinam ….Authore Gerhardo De Veer. A highly important map regarding the early search for a Northeast Passage. This remarkable map was drawn in 1601 by Theodore de Bry to describe the ill fated third voyage of the Dutch explorer William Barentsz in search of the Northeast Passage. 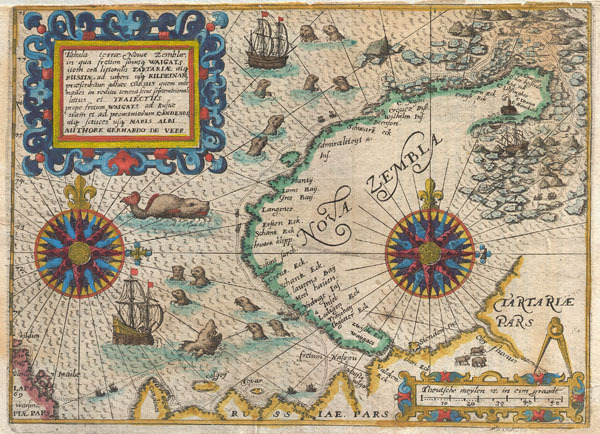 The map depicts the Island of Nova Zemba, or Novaya Zemlya, in the Russian Arctic along with two stunning compass roses, numerous rhumb lines, and a multitude of seals and sea monsters. Throughout the 16th and 17th centuries the concept of a Northeast Passage through the Arctic to Asia held the same significance as North America's Northwest Passage. The nations of Northern Europe, particularly Russia and Holland, were eager to find an easy route to Asia via the Arctic in order to access the lucrative trade with China and India. Barentsz's first expedition in 1594, in which he discovered Novaya Zemlya and a number of other Arctic Islands, was widely publicized in Europe and led to the assumption that a Northwest Passage may indeed be feasible. His second voyage, 1595, was considered a truncated failure due to inclement weather and ice packs in the Kara Sea. A year later, his third voyage in 1596 was a utter disaster. Our map details Barentsz's route as he passes north of Finland and thus into the Russian Arctic. His expedition then travels north and northwest along the western shore and ultimately around the northern tip of the archipelago. Here the ice flows coming out of the high Arctic trapped Barentsz 'sexpedition and ultimately forced them ashore. Using the timber from their ship they constructed a small cabin where, subsisting on stores from the ship and the occasional polar bear, they survived the unbelievably harsh winter. By June, the ice still refused to yield up the surviving ship, so the desperate sailors decided to try their luck on two smaller vessels. These, shown at the extreme right of the map, in seven weeks of harrowing sea travel eventually circumnavigated Nova Zembla and were rescued by a Russian merchant vessel near the Kola Peninsula. Barentsz himself perished on this desperate trip scarcely seven days after leaving Nova Zembla. However, some of his companions, on returning Holland, published an account of the voyage for which this map was made. In 1871, the Norwegian seal hunter Elling Carlsen rediscovered Barentsz' cabin on Nova Zembla - perfectly preserved due to the Arctic cold. Today icebreakers filled with tourists stop at the site as they round Nova Zembla. On a darker note, Nova Zembla, or more appropriately in this case Novaya Zemlya, was also the site of Russian nuclear testing during the Cold War. The world's largest above ground nuclear detonation, the 50 megaton Tsar Bomba, exploded here n 1961. Drawn by Gerhardo de Veer, a survivor of all three of Barentsz's expeditons, and published c. 1601 by Theodore de Bry in the third issue of the first Latin edition of Grands et Petits Voyages. Gerhardo de Veer (c. 1560 - 1620) was a Dutch sailor who accompanied the Friesian explorer William Barantsz on three ill fated expeditions into the Russian Arctic in search of a Northeast Passage. Unlike Barantsz himself, de Veer survived all three voyages as well as a harrowing winter on the glacier bound northern tip of Nova Zembla. After the death of Barentsz, de Veer and several other sailors made their way south through treacherous ice flows to the relative safety of the Russian port of Kola. It is largely through Gerhardo de Veer's narrative and maps that we know of the tragic events of Barentsz's third voyage. Theodore de Bry (1528 - March 27, 1598) was an important publisher active in the mid to late 16th century. De Bry was born in 1528 in Liege, then a Prince-Bishopric and thus independent of neighboring nations. The De Bry family were accomplished jewelers and copperplate engravers and, following the family tradition, Theodore apprenticed in these fields under his grandfather Thiry de Bry senior (? - 1528), and later under his father, Thiry de Bry junior (1495 - 1590). To avoid growing religious strife in the region Theodore de Bry left Liege for the more tolerant Strasburg. Shortly afterwards, in 1577, he moved again to Antwerp and, in 1580 to London, where he became well known for his engraving skills. It was either in Antwerp or in London that De Bry befriended the English publisher and editor of traveler's tales Richard Hakluyt. Inspired by Hakluyt's work, De Bry began to collect travelers' tales, particularly of voyages to New World. His most prominent acquisition was most likely the letters and papers of the French painter and mapmaker Jacques Le Moyne de Morgues discussing a disastrous attempt by French Huguenots to colonize parts of Florida. Around, 1588 De Bry moved to Frankfurt where he began his own publishing firm. Among De Bry's earliest and most prominent publications are his Grands Voyages, a multivolume compilation of travelers' tales that included the work of Le Moyne as well as some of the earliest published depictions of the North American mainland. The firm also published various other works including an important account of early English attempts to colonize Virginia with illustrations by John White. De Bry died in Frankfurt on March 27, 1598, having never left the shores of Europe, though his name was associated throughout Europe with tales of travel and adventure. Theodore de Bry was succeeded by his son John-Theodore (1560 - 1623) who continued the publishing firm until his own death in 1623. De Bry, Theodore, Grands and Petits Voyages (First Latin Edition, Third Issue), 1590 - 1634. Very good condition. Text and map of Kola on verso. Upper margin narrow, but intact. Winsor, J., The Kohn Collection of Early Maps, no. 350. Garratt, John G., The Maps in De Bry, 'The Map Collector', Issue 9, P9.